Twilight descends hard and fast near the equator. 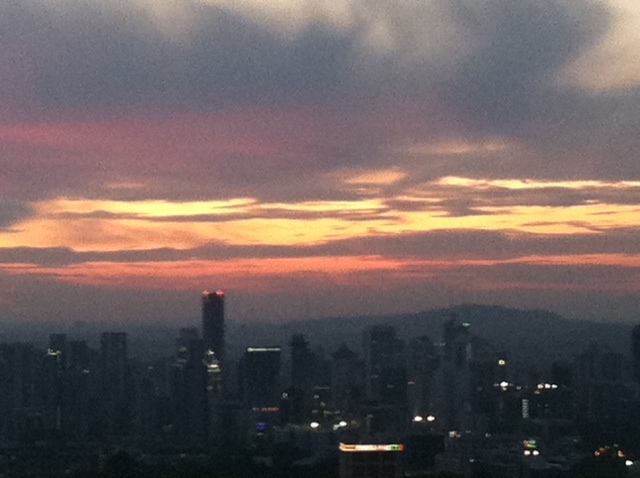 From our apartment windows in Simei, between the ubiquitous highrises, we see strips of pink amid billowing clouds. But last Saturday, we basked in a beautiful tropical sunset on the observation deck of the Marina Bay Sands “Skypark,” which provides a 360-degree view of downtown Singapore, the port, the east coastline, and the lights of the nearest Indonesian islands. It was an utterly touristy thing to do. But this weekend, the weather gods gave us a gentle wink, and we all felt blessed by the view, even among a swirling Saturday-evening crowd. And now, with little more than a month to go before our return to the States, the fleeting beauty of that sunset, captured on a whim, makes me think of how fast our time is passing here. Just that morning, we awoke to rain—all over the island, as Rob soon determined from his weather radar link. But we had tickets to see a play at the Esplanade Theatre that afternoon, and it was the last weekend of the Marina Lights Festival. 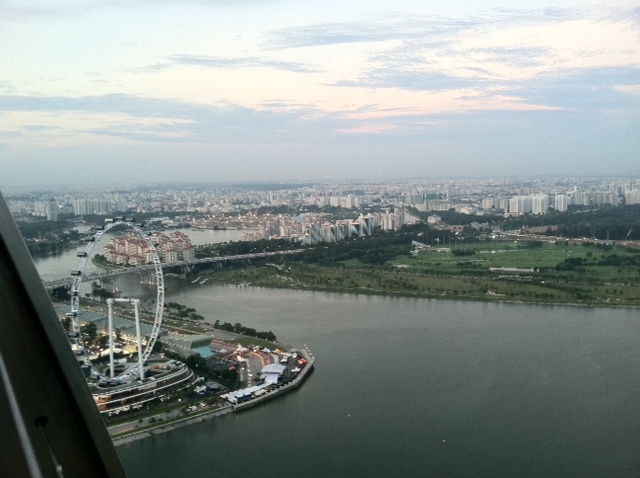 We set forth, because in Singapore, “weather” is a relative concept. It rains almost every day—either with big booming cloudbursts (like the crack of thunder that woke me this morning) or a steady shower for hours. It’s always hot and humid. Always. Except for an occasional monsoon wind. On Saturday, first came the subway ride from Simei to the City Hall stop: It was packed with people. (“Rush hour” on the green east-west MRT line is also relative.) By the time we got downtown, the sun was peeking through clouds. "View of the Marina Bay Sands Behind the Theatre"
The play, “Bibap,” a “beatbox action comedy” by a Korean troupe, turned out to be a lot of fun. 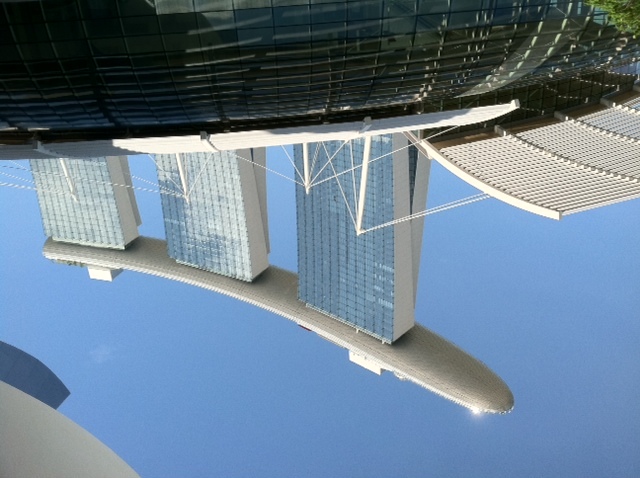 Afterward, we walked over to the Marina Bay Sands, which is a monumental structure that dominates the view from downtown and the Merlion—something like a floating barge on three giant pillars. But this was the first time we’d walked over to the Sands and taken a look inside the mall—a very fancy mall, including what we first assumed was an ice skating rink in the basement and a faux canal with boat rides that appears to be nodding to both Venice and the Mekong. 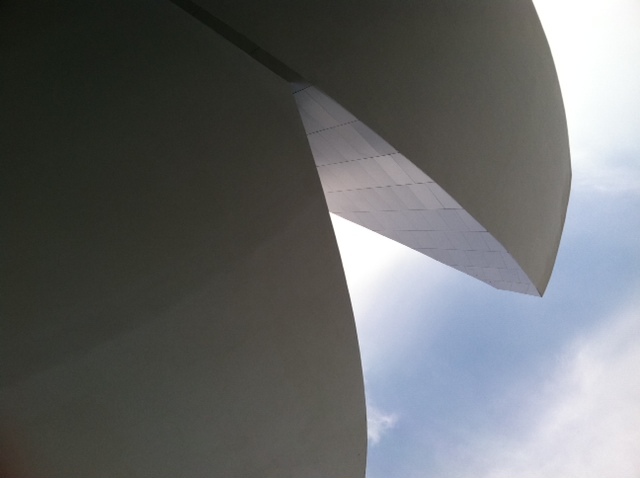 The ArtScience Museum, another architectural marvel—a cracked-open egg or a stylized white lotus—again, depending on your POV—perches beside the mall. There’s an Andy Warhol exhibit (“Fifteen Minutes Eternal”) at the museum now, but it was too crowded to take in on Saturday afternoon. 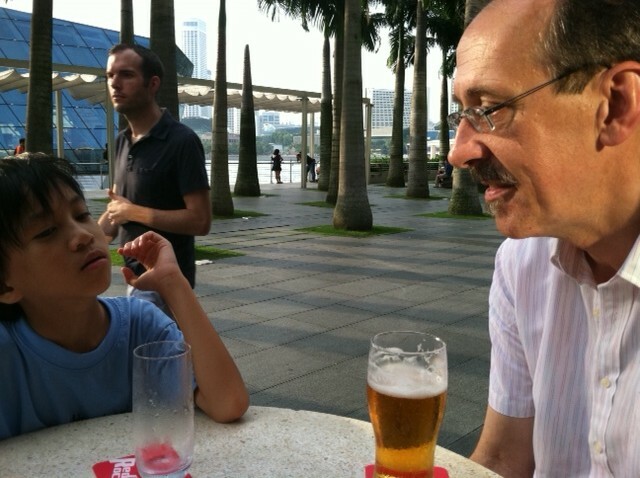 Instead, we found an open table at a sidewalk bar along the Bay and had an early dinner. 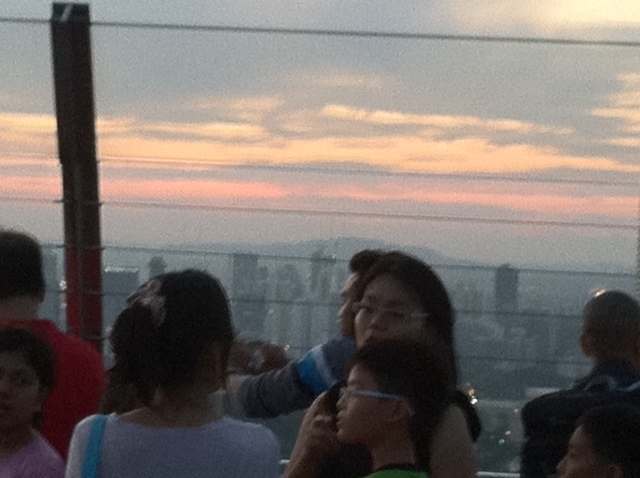 Then it was up to the Skypark for sunset, where we emerged just as the light had turned a magical pink-blue. Within moments, the sky had darkened. 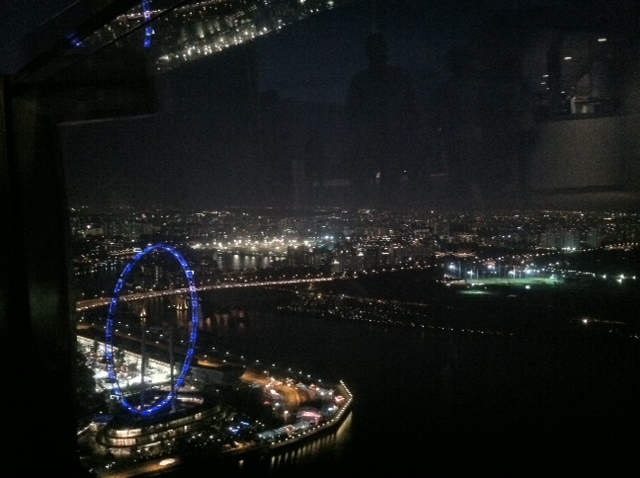 City lights popped on. We saw stars! 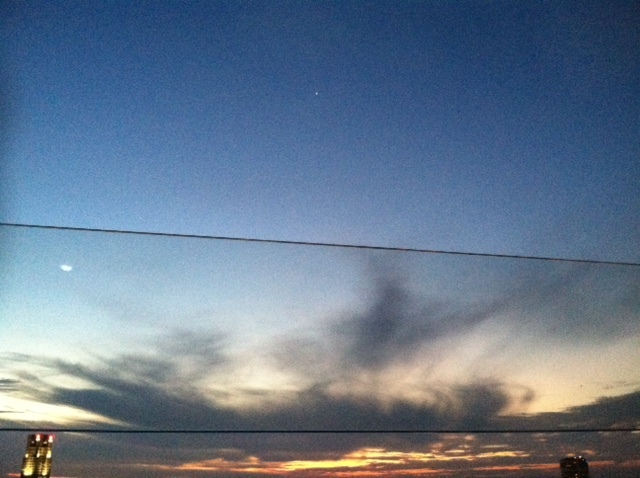 Starting with what I’d like to think is Venus, the Evening Star, but which Rob believes was Jupiter. A balmy breeze blew across the deck, loosening the bobby pins that held the hair off my neck. Families sat by the windows and on the deck floor, eating picnic food they’d brought. Because sometimes you just have to revel in a tropical evening. Sometimes you allow time to stop; you forget that the magic will be over soon. You may even stop clicking pretty pictures with your iPhone—as I did, resting beside my son while the gentle darkness came down. Thanks, Susan. Time does fly by, no question. Nick hasn’t found any specifically Singaporean graphic novels yet, although there is a local version of “Diary of a Wimpy Kid” (“The Diary of Amos Lee”). The local book he’s enjoyed most is a short chapter book called “The Singapore Kid,” which is quite amusing and reflects a lot of the cultural differences we’ve been talking about. Mostly, though, the big news in this regard is that Nick has really taken off as a reader. He plowed through the entire “Fablehaven” series by Brandon Mull in just a couple of weeks. He reads on the subway, sometimes utterly distracted. He’d like to keep reading as he walks, although I’ve nixed this. It’s great! When I first saw that picture of the Marina Bay Sands, I thought “Those buildings have a giant surfboard on top!” Then I looked closer and saw that, of course, it’s a giant traditional canal boat. 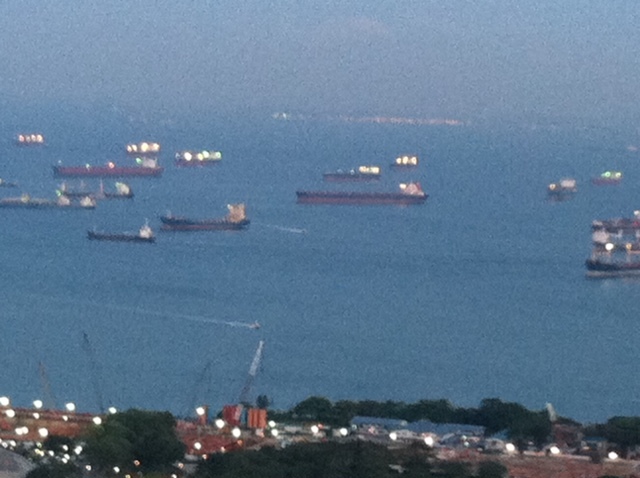 So how much longer are you going to be in Singapore? I remember that you were planning to spend some time traveling in the region.